"Tell me who your friends are, and I’ll tell you who you are." Despite Danding Cojuangco’s support, Grace Poe always reminds the public that she will never be beholden to Danding’s interests. With an image as clean as her mom’s Champion detergent, Poe’s supporters seemingly believe her. After all, her core platform is compassionate governance, right? 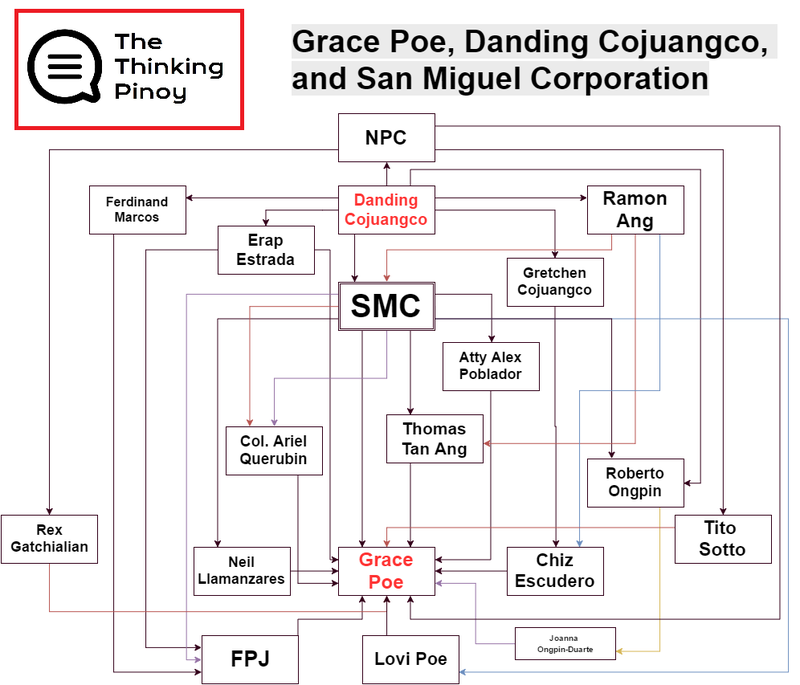 But let’s ask the question: just how connected is Grace Poe to Danding Cojuangco? For much of recent history, Danding Cojuangco lorded over San Miguel Corporation, owing to his controlling shares of the company, purchased using ill-gotten wealth from Coco Levy Funds [TP: Coco Levy Primer]. Over the past couple of decades, Danding and SMC have become synonymous. 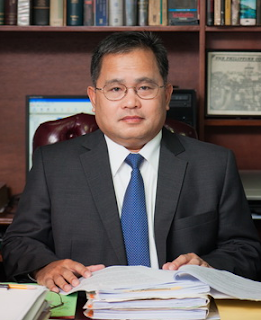 Danding is SMC's chairman. 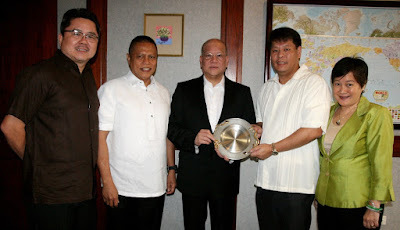 Ramon Ang, Danding's former mechanic who's now a billionaire (TY Danding), is SMC's vice-chairman [Bloomberg]. 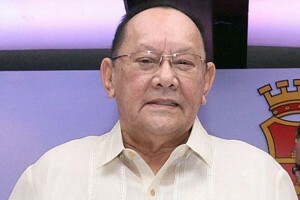 Widely considered as Danding's lap dog, he bought Cojuangco’s coco levy-funded SMC shares [Rappler]. 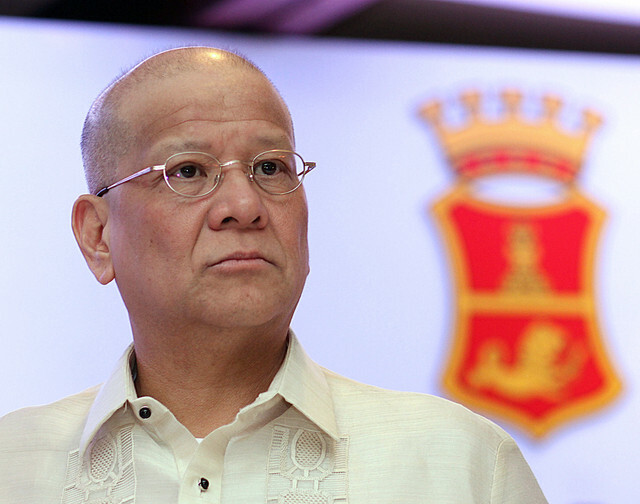 Basically, Ramon Ang is Danding's proxy, allowing Danding to engage in legal-corporate affairs with fewer hindrances. Cojuangco, Ongpin, and Ang are the poster boys of San Miguel Corporation, i.e. the poster boys of the Coco Levy Fund Scam. 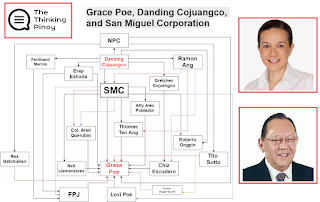 Now, it's time to list down the people and the companies that connect SMC with Grace Poe. First, Poe borrows planes from San Miguel Corporation for her campaign [Interaksyon]. Poe with husband Neil Llamanzares, an SMC employee. 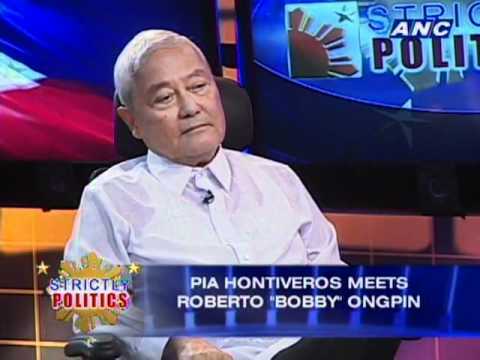 Third, Poe eyes coup plotter Col. Ariel Querubin (Ret.) as “crime czar” [Rappler]. Querubin is SMC’s internal security consultant [Journal]. Ramon Ang (center) with Querubin to his left. Fourth, Poe enjoys the support of the Nationalist People’s Coalition, whose founder and chairman emeritus is Danding Cojuangco [Inquirer]. Danding with Sen. Loren Legarda in an NPC event. 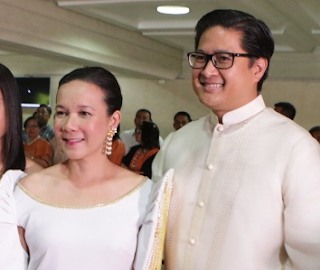 Fifth, Poe is endorsed by her godfather, convicted plunderer and ex-Pres. Erap Estrada [Philstar]. 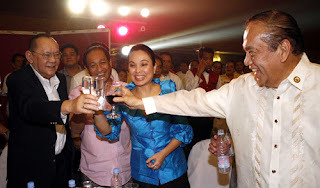 Danding Cojuangco bankrolled Estrada’s 1998 presidential campaign [PCIJ]. Estrada also ran as Danding’s VP when Danding ran for president in the 1992 national elections [PCIJ]. 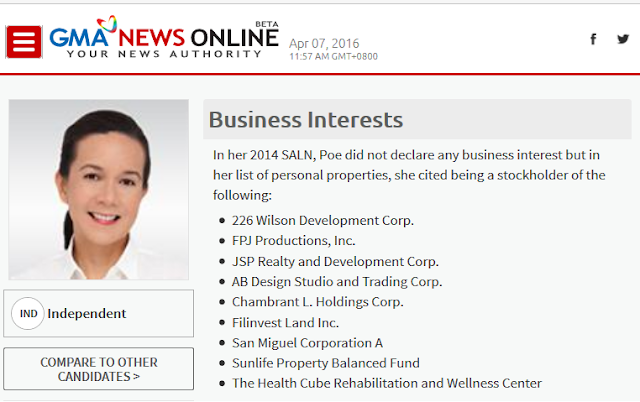 Estrada is also Poe’s wedding sponsor [Philstar]. 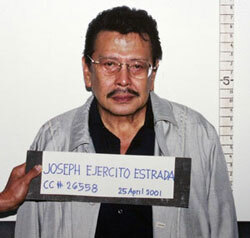 Estrada was convicted of plunder but was released via a presidential pardon from Pres. Gloria Macapagal-Arroyo, through the recommendation of then-Senator Manuel 'Mar' Roxas II [GMANews]. Sixth, Atty. Alex Poblador, Poe’s chief legal counsel for her Supreme Court disqualification cases [CNN], is a director of San Miguel Corporation [SMC]. Seventh, Poe’s father Fernando Poe Jr had very close ties with SMC, being the chief endorser of San Miguel Pale Pilsen throughout his life [SMC]. Some would argue that this is a petty thing, pero hanapbuhay yan, malaking pera pinag-uusapan dito. Eight, Late dictator Ferdinand Marcos, Danding’s benefactor, is a “ninong sa kasal” (wedding sponsor) of Poe’s parents FPJ and Susan Roces [Manila Times]. (L to R) Marcos, Roces, FPJ, and Imelda, taken at Poe's parents' wedding reception. 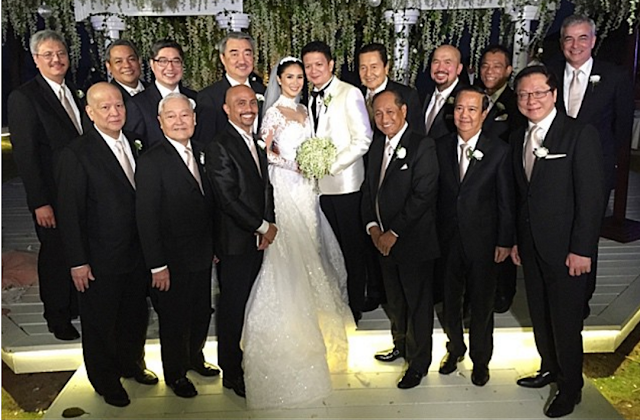 Ninth, Danding Cojuangco’s wife Gretchen, and SMC Chief Ramon Ang are wedding sponsors of Chiz Escudero and wife Heart Evangelista (a.k.a. Love Marie Ongpauco). Escudero is Poe’s vice presidential bet [Inquirer]. Ramon Ang (Front Row, Left-most) and Roberto Ongpin (to Ang's right), are godparents to the Escudero-Ongpauco couple. Tenth, Grace Poe’s close friend is high school classmate and Alphaland VP for Marketing Joanna Ongpin-Duarte [Inquirer]. 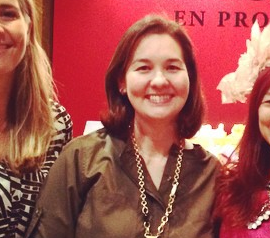 Joanna is niece to Marcos Crony, Cojuangco business associate, and Alphaland Chairman Roberto Ongpin [Alphaland]. Eleventh, One of Poe’s major campaign donors is Thomas Tan Ang, SMC director [BilangPilipino], relative of SMC’s Ramon Ang. 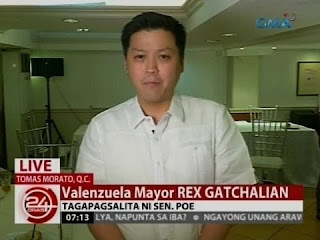 Twelfth, Grace Poe’s former spokesperson Rex Gatchalian a stalwart of Danding’s NPC [Rappler]. Thirteenth, Grace Poe's sister Lovi Poe is an endorser for Red Horse Beer, another SMC brand [Philstar]. Again, some would argue that this is a petty thing, pero hanapbuhay yan, hanapbuhay ang pinag-uusapan dito. Fourteenth and most importantly, Poe herself owns SMC stocks per her 2014 SALN [GMANews]. 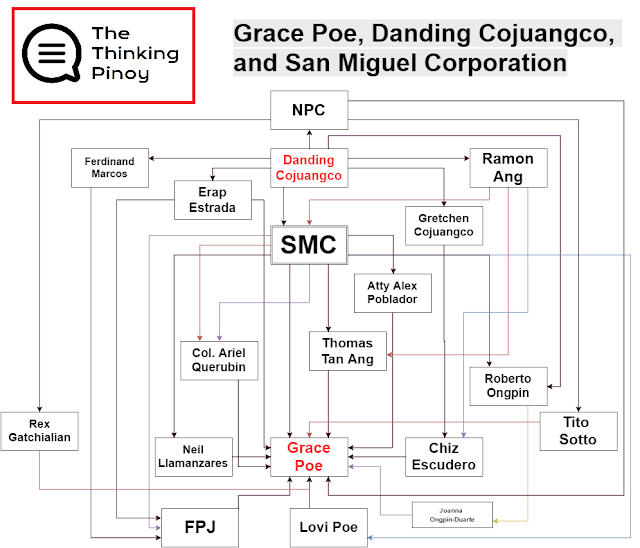 The diagram below shows all these connections, which are so numerous that Thinking Pinoy almost ran out of space to squeeze in the connector lines. 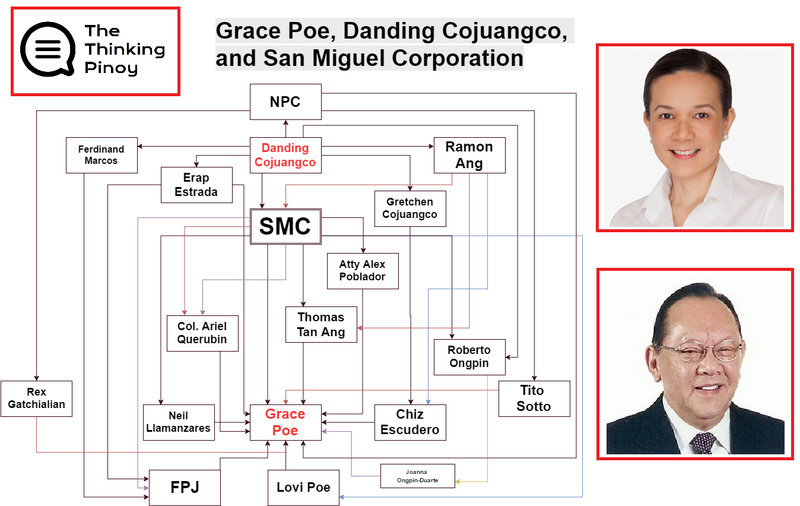 A chart showing some of Grace Poe's personal and business connections with Danding Cojuangco and SMC. Basically, we have shown that Danding and San Miguel Corporation are not just campaign donors to Grace Poe. Instead, Danding and SMC are so deeply embedded in her personal and professional life that's it really hard to isolate her history from the plunderer Danding's. How can Grace Poe convince us that she won't grant anyone any special favor, when it's clear that her life revolves around Danding?